Toshiba 55ZL2 review | What Hi-Fi? Now here’s something you don’t see every day – a TV offering not only four times HD picture quality, but also glasses-free 3D. 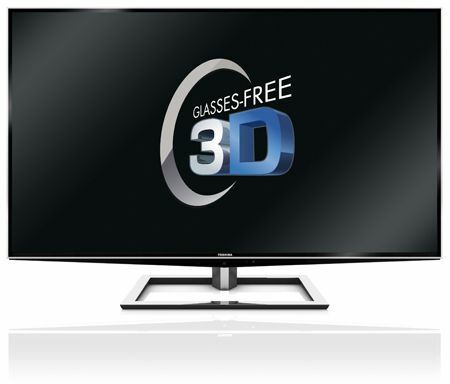 This is Toshiba’s 55ZL2 glasses-free 3D TV: now on sale in the UK at £7000, and now in our testing rooms. We grabbed a glimpse of the 55ZL2 TV at CES in Las Vegas back in January (here’s the moment, in fact), but now the Tosh is on the premises it feels like a fairly significant moment. After all, if consumers are to be believed it’s the requirement to wear glasses that’s been preventing 3D being welcomed with entirely open arms – so the 55ZL2 combines video processing and a special filter over the screen to do the '3D without glasses' thing. And then, as a pièce de résistance, the Toshiba has a screen resolution of 3840 x 2160 pixels which, as anyone with a decent grasp of maths will tell you, is four times the 1920 x 1080 resolution of your common-or-garden Full HD TV. Yes, this is a 4K TV. So in terms of headline technology, the ZL2’s in a class of its own. Admittedly the huge screen resolution is a only theoretical benefit right now: 3840 x 2160 content and players are conspicuous by their absence. And even Toshiba doesn't seem quite sure how to describe this new capability, the ZL2’s packaging and accompanying literature referring variously to ‘Quad HD’, ‘Quad Full HD’ and ‘4x FHD’. However, it's the promise of glasses-free 3D viewing that's been attracting all the attention since the Toshiba was announced: in the world of big TVs, features sell, then quality. For that reason, and as if the possibility of repeatedly saying 'It does 3D – and look, no glasses!' wasn't enough, this new set comes fully-loaded. There are three tuners on board (Freeview HD, digital satellite, and analogue for those few who are still receiving an analogue signal), and a decent (if not cutting-edge) suite of Smart TV features. BBC iPlayer and YouTube have their own icons on the on-screens, while all other online connectivity is behind the ‘Toshiba Places’ icon. There’s no web-browser, but plenty of time-consuming social networking and on-demand video content is available – if on-line functionality is a strong concern when choosing a new TV, though, you’ll dismiss the ZL2 as a little bit restricted. One of the two USB inputs can be reconfigured as a recording output, feeding an external hard drive, for example, and there are adapters included to allow component or Scart connections to be made (although if you’re considering using Scart to connect a device to your £7000 TV we’re going to end up falling out). Set-up is straightforward, thanks in turn to a remote control that’s logical and legible, tidy on-screen menus and a comprehensive, if not exhaustive, range of adjustments. Yes, you can fiddle with the likes of motion-processing to get things to your taste, but getting the best from this TV doesn't take six hours and encyclopaedic knowledge of the manual. For example, there's little scope for adjusting the ‘M800’ picture processing algorithm, but we found the ‘standard’ setting offered the greatest solidity and certainty to on-screen movement. If you want to go deeper, Toshiba has an auto-calibration tool (the TPA1) available: it functions as a USB-connected measuring sensor to offer a ‘pro’ level of picture fiddling. However, Toshiba inexplicably considers £7000 for the 55ZL2 an insufficient price to warrant including the TPA1 for free, which seems a bit mean – you may have to hunt around a bit to find one, and then pay around £150 or so for the unit. Or perhaps find a helpful retailer willing to lend you the device when you buy the TV? Once set up, the ZL2 is a really watchable television, like other recent flatscreen offerings from Toshiba. However, given that the screen resolution requires even HD broadcasts to be upscaled to suit, it won't come as any surprise that standard-definition broadcasts can look – and there’s no polite way of putting this – rough. Edges can shimmer, picture noise intrudes and detail is conspicuously absent. Movement induces something approaching panic, and skin-tones and textures are coarse. Switching to HD transmissions smarten up the act: black tones are particularly impressive in both depth and detail, and edge definition becomes crisper and more natural. Skin-tones improve significantly – they now look convincing! – and textures of all kinds are now visible. Contrast is strong and well controlled, with whites staying bright and clean even when lined up against inky blacks, and motion is handled much more steadily.. Considering the amount of upscaling the ZL2 is doing to fit a 1080 TV picture to its 2160 screen, the results are remarkably coherent. Given a high quality broadcast – and Sky’s HD coverage of Premier League football is about as good as it gets in the UK – the Toshiba looks strikingly confident. Switch from broadcasts to discs, and things are just as impressive. Luc Besson’s The Fifth Element looks most agreeable from DVD: yes, the picture is slightly soft, but there's a commendable lack of noise and that ability with contrast is again obvious. The colour balance is expertly judged, and movement is steady in all but the most challenging shots – a slow left-to-right pan while objects in the foreground move rapidly right-to-left, for example, can reveal just how hard the ZL2’s working. Again, however, the amount of upscaling the Toshiba’s doing makes the fundamental stability of its images all the more remarkable. Change up to the Blu-ray of Contagion and the ZL2’s picture quality steps up another gear: motion is solid, and in all other respects the Toshiba does sterling work. Black tone depth is excellent by the prevailing standards of LED-backlit LCD screens, and in terms of detail retrieval, edge definition, apparent depth of field and, particularly, contrast, the ZL2 bears comparison with the best 55in LCDs currently available – such as Samsung's UE55ES8000. Yes, those principal rivals are considerably less expensive than the Toshiba, but then nobody else’s 55in LCD TV can currently do what the ZL2 does – which, of course, explains the premium pricing. So it’s with a due sense of ceremony and occasion that we load up a 3D Blu-ray of The Adventures of Tintin: The Secret of the Unicorn, with a slight frisson of excitement that we're going to be watching 3D naked. Well, from the neck up, anyway! Once the screen has detected an incoming 3D signal, it instructs the viewer to press the ‘tracking’ button on the remote control. This instructs the camera integrated into the bottom bezel to detect any and all faces gawping at the TV (up to a maximum of nine, apparently), and then (theoretically) direct different images towards each individual viewer’s left and right eye. The lenticular technology at work here is, broadly speaking, the same as that which produced the ‘flicker pictures’ popular back in the day, and that currently allows car-drivers to view sat-nav information while their passenger watches a DVD on the same screen. It uses a series lenses – effectively a series of wedge-shaped ridges – across the screen to direct the approproate image to the requisite eye. And in practice, it’s remarkably effective: there’s no denying the three-dimensionality of the pictures the Toshiba delivers to the viewer (and indeed to several viewers). The effect is more subtle than that achievable when wearing glasses, which is without a doubt a good thing, with a consistent suggestion of depth and layering to images. There’s also nothing like the level of eye-fatigue that’s sometimes associated with active-shutter 3D, meaning this is every bit as relaxing an experience as viewing passive-tech 3D through simple polarised glasses. Most on-screen motion is as stable as that from the best of the glasses-dependent screens, and of course the system doesn’t suffer from the drop-off in brightness you get when wearing 3D specs. That’s not to say the Toshiba’s without 3D compromises – there's a couple, and they’re not insignificant. Firstly, the lenticular lenslets that work to deliver two different images to the viewer can betray themselves at times – on occasion it’s possible to discern a mild moiré effect, especially when the screen’s displaying a large, uniform colour. There’s just a hint of some wavy lines or shimmer – and, consequently, the impression that the image is being received from behind a less-than clear panel (which, of course, it is). More significant, though, is the ZL2’s absolute reliance on the viewer sitting very, very still when watching 3D content. The integrated camera can expertly pinpoint your seated position, but once you move away from that position there’s a big drop-off in focus, definition and 3D effect. And by ‘move away’ we don’t mean ‘getting up and walking off’. Simply shifting in your seat is enough to throw the ZL2, and if you’re the fidgety type you’re going to be pressing that ‘tracking’ button with monotonous regularity. Or investing in a neck clamp. As regards the other (currently) unique aspect of the ZL2’s performance, native 3840 x 2160 images look, frankly, astonishing. Detail levels are absolutely sky-high, and the most complex patterns remain steady and stable with the sort of casual efficiency that’s the mark of a properly effective device. Even if you sit much, much closer to the screen than your Mum would ever have allowed, images remain crisply and solidly rendered. As we said earlier, of course, there is precisely no Quad FHD software available right now – the moving pictures we saw as part of our review were supplied by a bespoke (for which read ‘home-made’) hard-disk that’s only going to be supplied to premium retailers selling the ZL2. The images? All perfectly-lit flowers in bloom and wide-open sky-scapes with super-saturated colours, with the occasional intricate brickwork pattern thrown in for extra ‘wow!’ factor. What movement there was involved slow camera pans or zooms, flowers opening in stop time-lapse or bustling city-scenes, again time-lapsed to make everything move ultra-fast. As such, the content doesn't tell you much about how this super hi-res system will handle real-world programming, or how the TV will deliver it. However, as a tool to demonstrate the Toshiba’s performance with native 3840 x 2160 video, it couldn’t do any more to play to the screen’s strengths – hardly surprising, given that this is a demonstration package. What we can say is that the pictures the ZL2 does generate with this stuff does make us anxious to see more: we’re not holding our breath for the arrival of commercially available software or disc-players, but given that there are a couple of 3840 x 2160 projectors already on the market, as well as this Toshiba, we’re keeping our fingers crossed that it’s sooner rather than later. Elsewhere, the ZL2 continues in the good-going-on-great vein. This is an excellent gamer’s TV, with negligible lag and a good handle on the sort of rapid, unpredictable motion that’s a staple of most console games these days. And the 3D presentation of Gran Turismo 5 (for instance) suffers less from the narrowness of the 3D ‘sweet spot’, as gaming tends to involve less fidgety movement than slouching in front of a film. Sitting up straight and concentrating does the Toshiba’s 3D presentation no harm at all. We don’t imagine anyone will be staggered to learn the ZL2’s audio qualities are considerably less jaw-dropping than its video capabilities. Like virtually every flatscreen we’ve encountered, this Toshiba sounds thin and anaemic, its lack of hardness at volume its only real plus-point. Mind you, if you’re in the market for a £7000 flatscreen of this calibre, it'd be criminal not to team it with a kicking surround-sound system. Oh yes, the price. There’s always a premium to be paid when getting in on the ground floor of a technology, so we weren’t all that surprised to find the Toshiba costs three times more than a brilliantly capable 'conventional' 55in HD smart TV. Trouble is, for this sort of money we expect every aspect of its performance to be impeccable – and, demonstrably, it isn’t. For £7000 we want glasses-free 3D that doesn’t fall to pieces if you want to move your head a bit, so clearly more development work is required in that department. We also want more 3840 x 2160 content, too, but that’s a rather different argument. Overall, though, there’s no question the 55ZL2’s an admirable gauntlet for Toshiba to throw down before to its rivals. We can’t wait to see what the response will be.